Travelling North on the A5 from Shrewsbury, turn onto B4396 at Nesscliffe, signposted Knockin. 3.5 miles after Knockin go straight over a staggered crossroad at the White Lion pub in Llynclys. 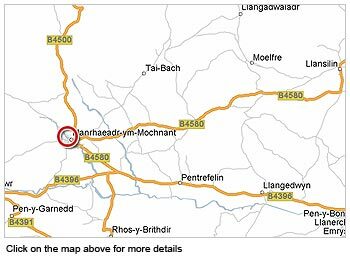 Continue on B4396 to Llanrhaeadr ym Mochnant (YM) (approx. 11 miles). 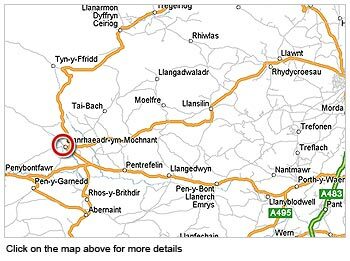 Travelling South on the A5, by pass Oswestry, turn off onto A483 towards Welshpool, turn right at White Lion pub in Llynclys, continue on B4396 into Llanrhaeadr YM (approx. 11 miles). Once in Llanrhaeadr YM take the first right after HSBC Bank in front of Greatorex shop into Waterfall Street. The property is 200 yards up the street and is the second large house on the right (signed Bron Heulog). Go up the winding drive and park in the space below the house on the left.